Harold Briggs was born in 1896 in Bottesford. His parents were Thomas and Annie Briggs. Thomas Briggs was born in 1859 in Bottesford and Annie Maria was born in 1861 in Peterborough. In 1891 the family lived on The Green. Thomas Briggs was a railway platelayer. By 1901 the family was living at Bunkers Hill and Thomas was working as a railway platelayer. The children included Earnest aged 15, Harriett aged 12, Herbert Abbott aged 11, Thomas aged 4 and Joseph Cecil aged 1. All the children were born in Bottesford. In 1911 Harold aged 14, was a farm servant at Riverside Farm, working for Thomas Guy Lovett. Harold’s service records indicate that he signed up for a period of 4 years with the 1/5th Battalion Leicestershires (Territorials) on 25th January 1915 age 19 years 10 months) at Loughbrough giving his trade as a ‘labourer’. By then he was living on Station Road, Bottesford. His initial service number was 3652. He travelled to France 29 June 1915. He made progress in his army service and was appointed as an unpaid Lance Corporal on 9th December 1916. Unfortunately he lost his strip the following June and was demoted to Private and transferred. The damaged records do not make it possible to work out where. However they do show that ‘when on active service: neglect of duty in reporting tent present when 200642 Private Oldfield was absent.’ One Corporal Wise was a witness to that effect. One can imagine what sort of circumstances might have lead a Lance Corporal to cover for one of his tent members. Interestingly his subsequent proficiency records at ‘loco cleaning’ still recognise his full rank in the workshop Railway Operating Diaries. He was tested every six months in the workshops of the Railway Operating Division and was found to be proficient in cleaning locos. By the end of the war he was promoted to 2nd Corporal with two stripes! Harold was demobbed in April 1919. `by then he was listed as serving with the 2nd Company Royal Engineers. Harold Briggs was awarded the: 15 Star, Victory Medal and British Medal. Harold’s elder brothers Herbert Abbott (b. 1890) and Arthur Henry (b.1883) also served. 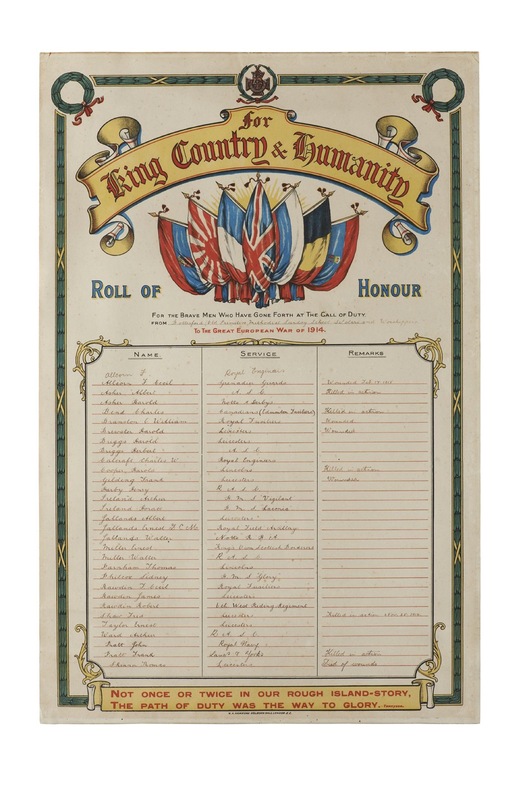 Herbert is listed on the Chapel Roll of Honour as serving with the Army Service Corps. His younger brother, Cecil, enlisted age 17 in 1917 with the Sherwood Foresters. Harold Briggs married Sarah Ellen Widdowson on 28th January 1919 at Bottesford and his brother Corporal Herbert Briggs was best man. Harold’s address was then 43 Hungerhill Road, Nottingham. Harold Briggs died in September 1970 and his death was recorded in Nottingham. 15 Star, Victory Medal, British Medal.